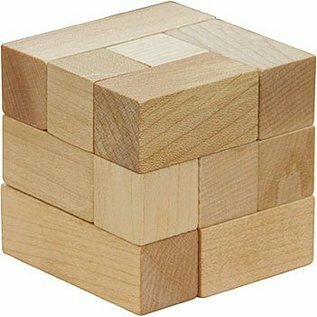 Soma Cube is our clear wood version of the classic three-dimensional solid puzzle. Seven unique shapes combine into a simple cube...and there's more than one solution. Makes a great holiday stocking stuffer for your favorite young puzzle-master. Soma Cube measures approximately 2-1/8", is crafted from locally sourced, sustainably harvested maple hardwood. Finished in teak oil and great for ages 8 and up.